While I was walking out of Wal-Mart the other night, after work, I was passing all the greeting cards. I look up and this is what I saw. Of course I had to stop and look at it and of course buy it, so I could share it with all of you. On the back of the card it reeds it was sent in for a Mallmark photo contest. 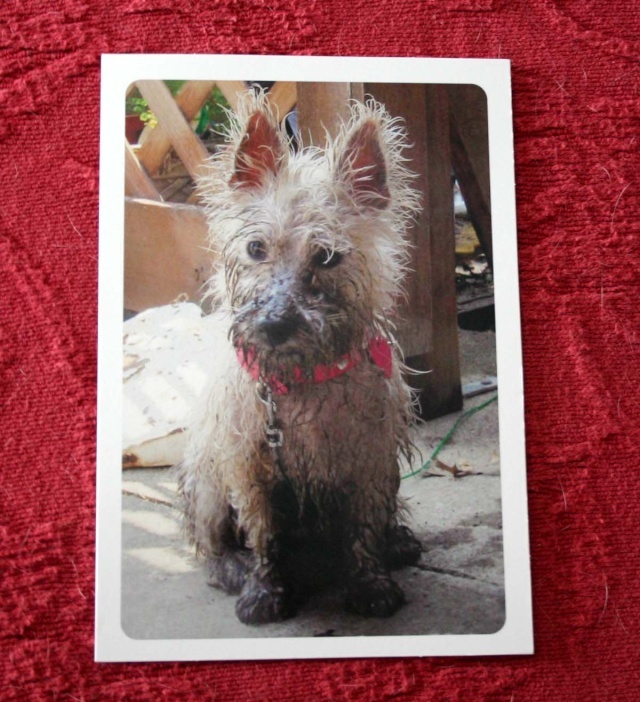 "Sherry's muddy puppy photo made friends and family laugh so much she's glad other will get a chance to enjoy it, too. Described as a bubbly, energetic, and outgoing, Sherry believes in seeing the humor in life and yourself and sharing it with others--anytime, anyplace!" Finalist Sherry Setters, Tulsa, OK.
Well does anyone know Sherry I'm sure glad she is sharing her podengo with the world. Too funny - great picture - maybe we should google her! The rest of the story - first off she is on facebook and lists as her interestes her "westie'. She works with people with disabilities and the contest winners are in another contest to see who sells the most cards for an additional cash prize.